MILAN, ITALY (MF-DJ) – Macchi, a division of Sofinter Spa – an Italian company leader in engineering, manufacturing and procurement of industrial boilers and HRSGs – has been awarded by the US division of an international Chemical company with a contract of more than 36 MUSD for the supply of 3 industrial boilers and 2 heat recovery steam generators to be installed in a Polymer plant under construction in Texas (USA). 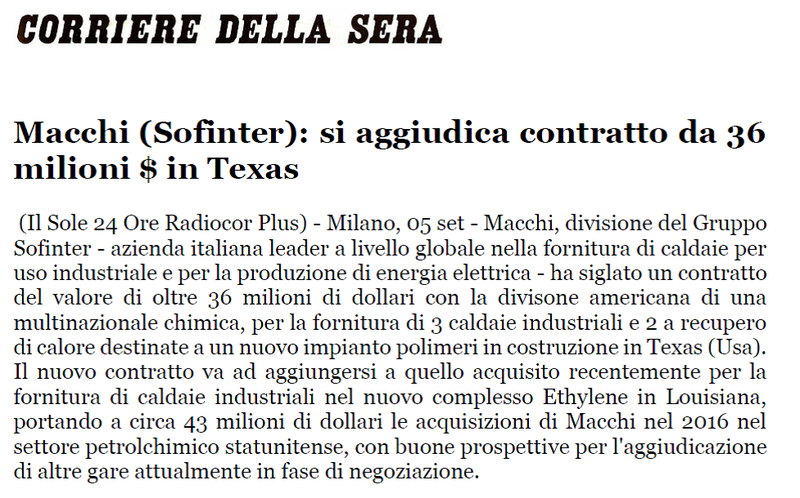 The new contract becomes part of a streak of contracts awarded to Macchi, including a recent one for the procurement of industrial boilers for an Ethylene plant in Louisiana, bringing the total of 2016 Macchi awards to 43 Million USD in the US Petrochemical sector, with good potential for more considering the ones in the negotiation phases. Macchi’s activities in the US market has registered a significant increase in growth thanks to competitive factors such as technology know-how, continuous improvement in energy efficiency and emissions. Today MACCHI is brilliantly inserted in the expansion of the petrochemical sector, refinery and LNG (Liquefied Natural Gas ). This sector nowadays is the most potential one due to the high availability and low prices of the gas feedstock. 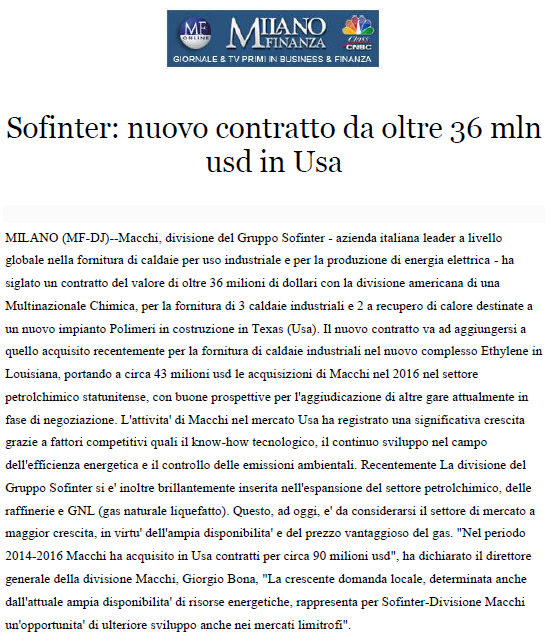 Giorgio Bona Macchi General Manager said: “In the 2014-2016 period, Macchi has been awarded in the US for about 90 Million USD” and “The increasing of local demand, due to the high energy resources availability, represents for Sofinter-Macchi Division an opportunity for further development in the adjacent markets”.